We are issuing a call, actually more like a plea, to all synagogues. It’s a simple request, really. Please remove all pics of empty sanctuaries from your website. The photographs used on your website are powerful. Think about what a photo of an empty sanctuary is saying. Such an image certainly doesn’t give off a warm, welcoming, or even interesting vibe. In fact, the opposite is true. Images of desolate sanctuaries feel lonely and well, empty – definitely not the image (no pun intended) that you are trying to convey. Your synagogue is dynamic, youthful, spiritual, family-oriented and so much more. Let all of the positive adjectives that you use to describe your synagogue guide the website photo selection. Think of the photos on your website as an opportunity to bring the vibrancy of your community to life. Show off the wonderful community you’ve created to the world. 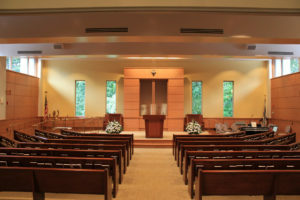 Use photos to tell your story and to entice new members to take a fresh look at your synagogue. Encourage existing members to get more involved in synagogue life. Empty sanctuary pics don’t inspire. They don’t delight. You could even argue that they are hurting your synagogue website and by default your synagogue’s marketing, membership, and outreach goals. Simply put, it’s time for them to go. Other examples of images that have run their course include deserted social halls, lonely bimas, desolate classrooms, vacant libraries, dark-lit atriums, and gift shops free of customers. Exceptions include engaging photographs showing your social hall with Pinterest-worthy decorated tables and floral arrangements or artfully staged images of your bima. So, what kind of pics do belong on your synagogue website? Zoom in on snapshots of religious school programs, participants gathered for lunch and learn or lecture, events geared towards seniors, Tot Shabbat, kids playing outside, and so on. Take a look at how these Conservative synagogues – all of whom are unable to photograph during the Sabbath or other services, still have dynamic community oriented images displayed on their websites. After all, there are people in your building or events happening every day of the week – not just Friday – Saturday evening. A modern and welcoming website is one of the most powerful and effective ways for your synagogue to grow and better market themselves to new members – especially young families. Updating your website with vibrant pics is one of the best ways to help your Jewish community thrive online. Please, share this advice with your friends and fellow congregants… just say no to ESPs. We specialize in designing professional and modern websites that are as vibrant as your congregation. Get in touch and learn more about how we can help your Jewish community thrive online.